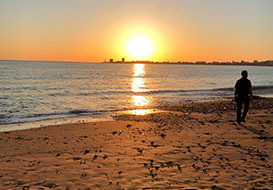 Rent a villa in Les Sables d'Olonne, Vendee. Sun, sea, town and nature - something for everyone when you rent a holiday villa in Les Sables d'Olonne. Les Sables d'Olonne is the star holiday destination on the Vendee coast and this charming resort has everything you need for your family holiday. The lively sea front with it's 3 mile sandy beach, children's activities and endless cafés and restaurants is the hub of the town and just a short walk from the historic old quarter. "Les Sables"is famous for the single-handed round the world yacht race, Vendee Globe, that sets off from the port. The town offers an attractive historic centre with pedestrian streets to while away the day amongst the café terraces and the lovely boutiques - just relax and unwind. The huge indoor market is near at hand, offering a magnificent choice of local fish and seafood. In the summer evenings the sea front is the place to stroll and is animated with craft markets and musicians. A superb choice of restaurants for your evening meal, and later there is the lively nightlife, or try your luck at the casino. 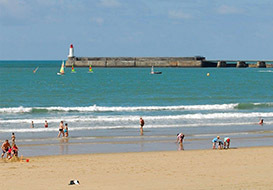 Les Sables d'Olonne offers excellent facilities for water sports with a superb centre offering equipment hire and tuition - surfing, kite, stand-up, wind-surf, sea canoeing, as well as sailing initiation on a large lake. If you're a fan of water sports, it's a perfect place to book your holiday villa in the Vendee. Surfers will also appreciate the nearness of the famous Bud-Bud beach (17 miles / 35 minutes). The Chaume district of Les Sables d'Olonne to the north end of the town, with its quaysides and traditional fisherman's houses, provides a quiet spot to explore, including the naval museum and the St Nicolas priory. 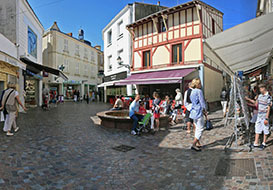 There is a foot ferry to Chaume from the end of the esplanade and sea busses link all the port areas to the town centre. There are guided tours of the fishing port as well as fascinating heritage ships to see. 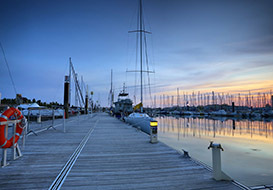 It's also possible to book a sea excursion on the traditional sailboats, Diva and Messaline. A calm and family-friendly holiday development on the outskirts of Les Sables d'Olonne, offering excellent facilities on site. There is a quality restaurant, a bar, a snack bar, a bread shop, a further large communal pool, cycle hire, a tennis court, a children's playground, basket-ball, giant chess and table tennis. 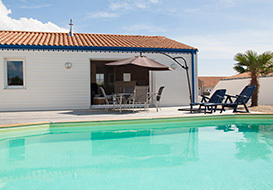 Les Jardins d'Olonne offer 4 types of individual villas, sleeping 6 to 8 people, each with their own private swimming pool. At the moment there are discounts of 10 to 20% on remaining dates and a further discount on fortnight bokings! A top quality villa with its own heated pool. Spacious accommodation, 4 bedrooms, 2 bathrooms, private garden. Well equipped, with TV, WiFi, dishwasher, washing machine, etc. Just over a mile from the lovely beach and water sports at Le Tanchet and 3 miles from the town centre of Les Sables d'Olonne - within cycling distance of all amenities. A lovely villa with its own heated pool and private garden. Comfortable accommodation with 3 bedrooms, 1 bathrooms, Well equipped, with TV, WiFi, dishwasher, washing machine, etc. Just over a mile from the lovely beach and water sports at Le Tanchet and 3 miles from the town centre of Les Sables d'Olonne - within cycling distance of all amenities. A spacious villa with its own heated pool and private garden. Well equipped, with everything you need - TV, WiFi, dishwasher, washing machine, etc. 4 bedrooms, 2 bathrooms, Just over a mile from the lovely beach and water sports at Le Tanchet and 3 miles from the town centre of Les Sables d'Olonne - within cycling distance of all amenities. Its own heated pool and private garden. A well equipped villa, with everything you need - TV, WiFi, dishwasher, washing machine, etc. 3 bedrooms, 2 bathrooms. Just over a mile from the lovely beach and water sports at Le Tanchet and 3 miles from the town centre of Les Sables d'Olonne - within cycling distance of all amenities. Ideal holiday accommodation for two families together, being in two separate parts, each with two bedrooms and a shower room, the total sleeping up to 9 people. Two attractive deck areas plus a spacious terrace garden and a private heated pool. The pool has a sliding enclosure extending swimming into early and late season. Rocky coves from 500m and Le Tanchet beach at 0.75 mile. 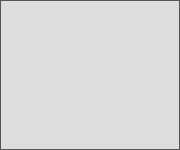 Nearest amenities 600m. 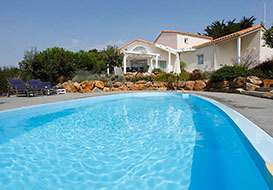 A quality villa on the sea front at Le Tanchet beach. First floor accommodation with 3 bedrooms. Lounge / dining with magnificent viewsover the sea. Further studio bedroom on the ground floor. Off road parking (2 cars). 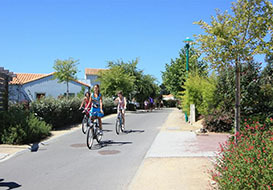 Cycling distance to the nearest shops, sea front restaurants within walking distance. 200m to the water sports centre. Regular bus service on the sea front, to and from the town centre. This attractive modern villa is set in a calm residential area amongst pine trees at Jard sur Mer (15 miles / 35 minutes from Les Sables d'Olonne). Just 300m from the nearest beach and 1.25 miles from village amenities. 4 bedrooms and 2 bathrooms. The private heated pool is fully fenced, so ideal for young children. Situated in a quiet residential area on the edge of the village of L'Ile d'Olonne, 6 miles / 13 minutes from Les Sables d'Olonne. Just 4 miles from the lovely beach of La Sauveterre. In the village at 1½ miles you will find a restaurant, a bar, and basic shops. Attractive interior, opening onto a large deck and private heated pool. 2 bedrooms, 1 shower room. Les Sables d'Olonne is easy to get to. Direct dual-carriageway link from the A83 motorway. The main town beach has children's activities, is shallow sloping and with lifeguard. Heated seawater pool on the sea front. Watersports centre at Le Tanchet - equipment hire and tuition. Sea salt production - see the traditional methods and boat tours through the marshes. Fabulous cycling in the salt marshes. Rocky coves to explore, south of the town. EcoZoo - Home to more than 400 animals : giraffes, red pandas, lions, surricates, penguins, wolves... The zoo is dedicated to preservation of the biodiversity. Saint Croix art museum - one of the most important in France for contemporary and modern works. Lighthouse - Tour d'Arundel - visits during the season, superb panoramic view of the town. Museums - several, including shellfish, ww2 military history. Golf course (and 3 others within 45 minutes drive). Aerodrome - parachute jumping, links to the Island of Yeu. 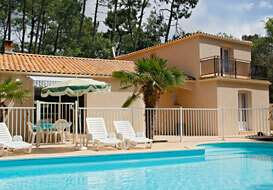 Find your ideal holiday villa in the Vendee. Situated on the west coast of France, the Vendee is one of France's most popular holiday destinations. Its unique combination of varied countryside and glorious coastline meets everyone's holiday needs. The Vendee has picturesque villages, historic towns, true French culture, some of the best beaches in France and a magnificent climate - yet within a comfortable drive from the channel ports. 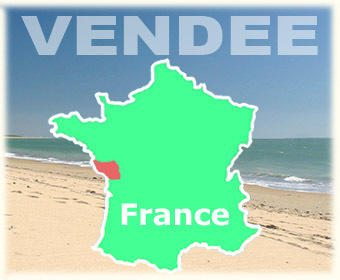 See some videos of the Vendee.